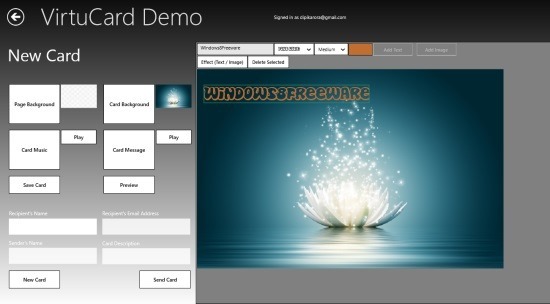 VirtuCard Demo is a free Windows 8 virtual card maker app available under ‘Photo’ category of its app store. This virtual card maker Windows 8 app lets you create and manage innovative custom cards for any occasion. Be it a birthday wish, a wedding anniversary, an invitation card, a sorry card, or a thank you card, you can create just any type of virtual card by mixing and matching different elements such as musical clips, background images, add message to your card, change font according to your preferences, and much more. Now, the interesting part is that you can select from the given images and musical clips, or upload your personalized images, video clips, or musical clips. Also, you can use webcam to capture video clips and then attach it to your card. Once you have finalized your card, you can now send it to your loved ones, from within the app. Well, yes.. there are options where you need to enter ‘Recipient’s Name’, ‘Recipient’s Email Address’, ‘Sender’s Name’, and ‘Sender’s Email Address’. You can now click on ‘Send Card’ button to send the E-card. You can also save card for later usage. To start creating virtual cards, you need to register yourself using an Email ID and you will receive a confirmation mail for your registration. You can now login to your VirtuCard Demo account and start creating custom cards. Let me quickly point out the main features of this Windows 8 virtual card maker app below. Lets you create and manage custom cards for different occasions such as birthday wish, a wedding anniversary, an invitation card, a sorry card, and the like. Comes with various elements such as musical clips, background images, font, colors, and much more. Lets you send E-card to others, from within the app. Lets you save your customized card for later usage. To start, you need to register yourself and create an account that takes less than a minute. Lets you mange previously sent cards. Well.. I loved this virtual card maker Windows 8 app as it helps me to let go the card artist in me and to explore my creativity using various attractive elements available for free in this VirtuCard Demo Windows 8 app. Also, check out our posts on Card Making Software, and Photo Makeup Apps. Click on ‘View in Windows Store’ after opening this link in Internet Explorer10. Proceed with further installation steps to install the app in your system. In short, VirtuCard Demo is a good utility Windows 8 Virtual Card Maker App to create customized E-cards and to explore the artist inside you. Go ahead and download VirtuCard Demo app in Windows 8 now.